Lots of people are moving out of the Bay Area this summer. The local newspapers predicted this mini exodus. Cost of living is the beast driving people away: the pressure, the sacrifice—it's real, and many have had enough. I can't blame them. When you stop and think about the life you could live elsewhere, outside of this cyclone, sometimes it makes sense to leave. 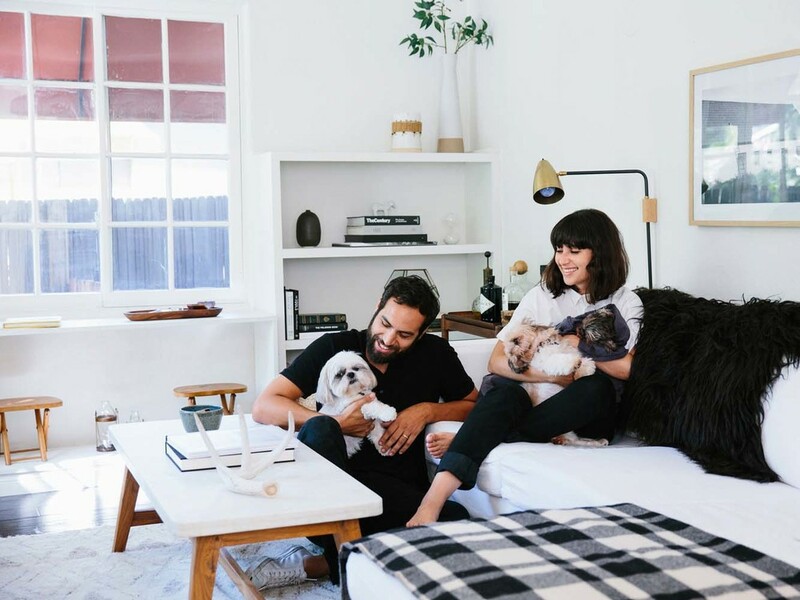 Over the past 15 years, my husband and I have lived in 6 rentals all within a 1-mile radius of one another; we really like our Silicon Valley nook and we've been able to remain by hopping around. Because of the astronomical cost of housing, most of us inhabit small homes. This explains how I didn't have a mud room until three years ago. Our last rental home had a large room off the garage with washer/dryer hook ups and built-in cabinets from floor to ceiling. I swooned over this space, I would walk in and do pirouettes. It was my favorite room in the house. Some might call it a laundry room, but it was so much more than that. As household manager and Captain Mom, having a secondary entrance where we could stash all the stuff of life was revolutionary. My husband wanted to call it the Locker Room, which was clever, but my east coast childhood prevailed (I lived there ages 10-22) and it was crowned the Mud Room. My husband was understandably misled by this name. Soon after moving in, I walked in on him hitting his running shoes together to get off the dried mud. I exclaimed, "What the heck are you doing??!!" He said, "Isn't this what I'm supposed to do in the mud room?" I took a deep breath and explained to my 5th generation Californian hubby that a mud room isn't a place to mud wrestle, make mud pies, and take mud baths. The name originates from regions that have long winters; it's a place to take off shoes, put away coats and bags, stash your Costco run until you have time to put everything away. It's an entry point for everyday life, a drop zone. If some mud gathers there, well, ok—if it has to land in a room, that's the room where it should be. A couple months ago we had to move and say goodbye to the beloved Mud Room. My life was forever changed by that room; I left determined to make a mud room wherever I reside. I'd tasted the good life and I couldn't turn back. When we took up residence in a smaller home without the luxury of a designated mud room, my challenge was before me: I paced the house, analyzed the floor plan, lobbied hard with my husband for the square footage I would need (he was still perplexed by this mud room thing). I selected a wall next to an outside entrance; it was an empty wall without an obvious purpose—perfect! Now I knew where it would go, but I wasn't sure how to make it. My mom sent me a photograph of a Pottery Barn mud room wall for inspiration and it dawned on me that I had something similar to every piece of furniture in the photo. Ta-da, my mud room was birthed with nary a 2x4. You can do it too. START BY SELECTING A WALL. Create your mud room along a wall to optimize space. Ideally, this wall will be next to an outside entrance so you can opt to enter and exit via the mud room. I used 1/6 of a back room with a sliding glass door to the patio. 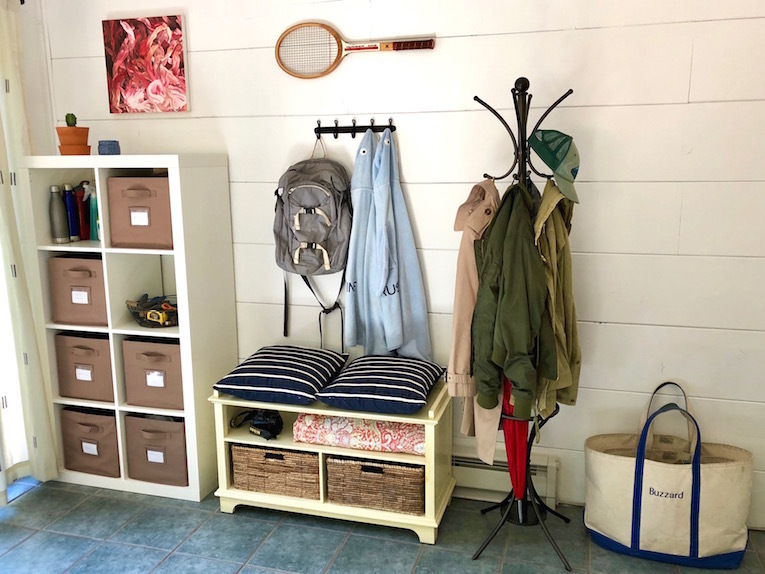 It's okay if you don't have a secondary entrance to your home; you can make a mud room space by the front door, it will be like an entryway storage zone. You could also create a mud room in a space where there isn't an entrance point. You could even make a mud room outside: on a porch or along the exterior wall of your house. The back wall of a garage is a fantastic option for a mud room as well. I selected a wall that didn't have an obvious purpose and wasn't going to be used for much. My mud room takes up 10 square feet of space (8 feet long, 1.25 feet deep). I was so taken aback by this minuscule footprint calculation that I double checked my math. If I measure more liberally to include the entire length of the wall and some frontage space (which I often use as a drop zone), it takes up 33 square feet (11 feet x 3 feet). Not bad, and serving a noble purpose. FILL THE WALL WITH A BENCH, HOOKS, AND STORAGE. You'll want a place to sit, a place to hang things, a place to stash shoes, and as much hidden storage as possible. Optimize that precious vertical space. Think creatively and work with furniture you already have. Hunt for free stuff on Nextdoor, too. Look closely to observe the details of my mud room. Water bottles are like ants that take over my house, so there's a shelf for them. (Now that I'm thinking about it, maybe I should put them in a box. This mud room is a work in progress.) Bags are unruly pests that end up everywhere: there's a box for them. There's a seasonal box for Sunscreen & Swim that holds suncreen in all forms (spray, stick, cream, full body suit) and goggles. There's a box for Returns and one for Miscellaneous (how organizationally challenged people stay "organized"). There are hooks for jackets and towels. I placed a shoe bag on the back of the door; we don't keep all of our shoes here, just some. And don't miss my precious L.L. Bean tote bags, at the ready for any task I might assign. The family adventure backpack is there too, on the hook, ready to be loaded up for the next beach trip or hike. I added some pieces of décor to beautify the space: an oil painting my sister made for me, a cactus, an old tennis racket, a candle. I hope this article inspires you to look at your home with fresh eyes and make a mud room. Or maybe yours will be called a locker room, a drop zone, or an entryway. Call it what you want, it's purpose is the same: to organize your everyday gear and position you to better live and enjoy your life.